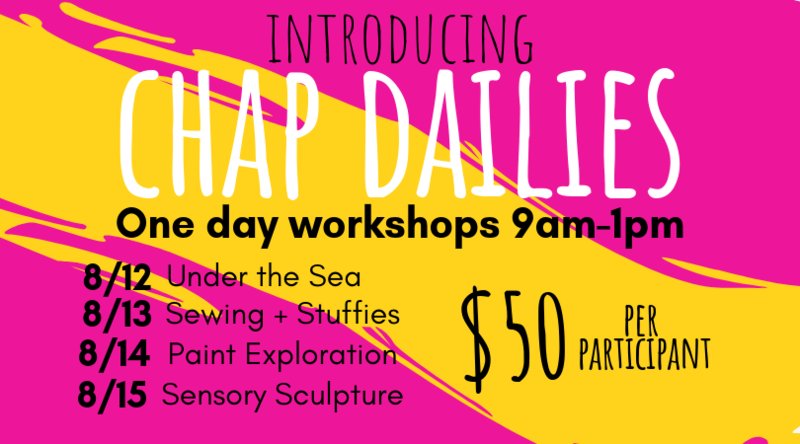 In our fifth year of Inclusive Summer Workshops we wanted to try out a new format, in what we're calling CHAP Dailies. These one-day workshops are designed to offer a taste of what we do during our traditional summer workshops, but with a specific theme in mind. These workshops are a great option for busy schedules! The daily four-hour art sessions are designed so children have the time to work wholeheartedly on their projects without experiencing creative fatigue. Time for lunch and outdoor play is incorporated daily! All workshops will be held at the CHAP Studio, located at 8065 SE Grand Ave (between SE Spokane + SE Tacoma) in the Sellwood neighborhood of Portland. Dive into a sea of creativity! On this day, children will explore multimedia projects with an aquatic theme. Projects include but are not limited to: watercolor salt art, salt sough starfish, ocean sensory bottles, turtle stuffies, dancing fish, + more! Learn to sew or build on existing skills! Children will explore the craft of sewing both by hand and by machine, creating meaningful projects such as quilted pillows, stuffies, + aprons. Paint, Paint, Paint! Mix things up with all kinds of ways to paint. Projects include but are not limited to: pour painting, watercolor techniques, resist painting, feet painting + more! Paper mache, sculpture hand casting, Sculpey clay miniatures, mixed media, + more! Please note any allergies or dietary restrictions here + anything else we should know. The cost of each workshop is $50 per kid. If signing up for multiple workshops or have multiple kids, please indicate under "Quantity".